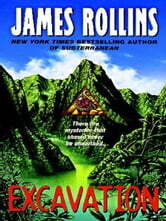 A classic adventure from James Rollins, the author of The Doomsday Key, The Last Oracle, The Judas Strain, Black Order, and other pulse-pounding, New York Times bestselling thrillers, Excavation carries readers deep into the jungles of South America, and into the terrifying heart of dark mysteries that should never be unearthed. SPANIARDSDREAMING OF JUNGLE OF DREAMS, RICHESAND WELTH LUST FOR GOLDWOULD DAM THEM ALL.A MUMMY CONOULSING HAIR WIPPED ABOUTWITH THRASHING HEAD WITH GOLD COLORED FLUD BURSTING FROM ITS HEAD.A SUBTANCE OF AN AMALGAM TYPE OF METALDIGGING AT A VERY OLD SIGHT BEING TRAPED UNDER GROUND FINDING A WAY TO CAVERS AND TUNNEL BUT THROUGH VERY DANGERUS THINGS AN OLD INCAN VILLAGETO AHIDDENINCAN TOWN, SAPA INCA.THE MOCHIO FIRST CAME TO THIS PLACE BUTTHE MOCHICO KING WAS KILLED BY THE INCA KING PACHCEUTE WITH HIS ARMY MADE THE MOCHICO SLAVES.THEN FINDING A CAVE WITH THE SUN GOD INTI THE SUN GOD HIMSELF ALL THE MOCHICO WERE KILLED FOR DISRESPECT TO THE INTI SUN GOD REWARD FOR THIS A TEMPLE GREW IN A CAVE A HUACA CONSTRUCTED FROM THIS HOARD OF MUCHICO SUN GOLD A SACRED TEMPLE THAT INTI HEALED THE SICK,KEPT DEATH FROM THOSE WHO HONORED THE SUN GOD SO YOU SEE WHY THE SPANISH WHEN FINDING THIS PLACE THEIR EYES GROW HUNGREY AND KILL AS MANY INCAAS POSSABLE AND KILLS AND BEHEAD THE KING MEANING TO ALSO STEAL INTI FROM THEM (GOLD).SO AS THE MONKS OF THE SPANISH FLEE BLOODING A SCARED SIGHT IS MUMMFYED AND PLACED IN A CRIPTTHUS THE REST OF THE STORY IS FOR YOU TO READ ITS GREAT. Great setting - Amazon is so intriguing and mythical. Exciting. Just like an Indiana Jones movie!